A merry, merry Okinawa style Christmas celebration is on tap this weekend with Camp Courtney’s Christmas and Holiday Festival. Camp Courtney officials say the festival, which takes place Saturday from 3 p.m. to 10 p.m., and Sunday 1 p.m. to 10 p.m. at the Commissary/PX complex will light a spark in every heart on Okinawa. This year’s festival theme, The Giving Tree, presents the tale of a selfless tree that graciously offered a young boy everything he wanted. 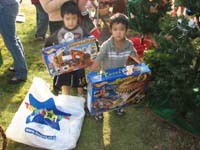 Saturday at 3 p.m., the festival’s giving trees promise lucky boys and girls ages 10 and under an early Christmas present courtesy of Mattel Toys. The key is listening today and tomorrow to Wave89 AFN Radio to learn how to earn a spot in front of the generous green wood-beings. Festivals are principally parties, and you cannot have a good one without good food, good music, and friendly competition. 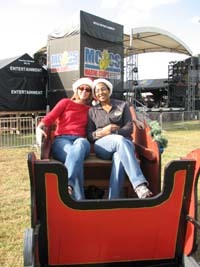 The Camp Courtney Christmas and Holiday Festival has it all; and is primed to delight both service members and locals alike with free top-notch entertainment, game booths, amusement rides, carnival rides for the children, and enough diversity of foods to appease the heartiest appetite. A Kid’s Carnival, featuring Santa, clowns, and giveaways, will kick off at 3 p.m. on Sunday, December 21 at the main stage area. 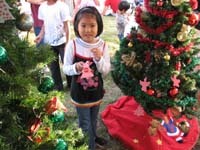 Santa will attend both days—so don’t forget to bring your camera. And that’s not all. In the continued spirit of giving, Marine Corps Community Services is offering great giveaways and prizes provided by generous sponsors. So, whether you’ve been naughty or nice (preferably nice), there just might be a present for you. This year, one lucky winner will win round trip tickets to the United States and there is a possibility of winning a seating class upgrade as well, courtesy of United Airlines and Omega World Travel.